(left) Shapla wants her vision back so she can pursue her studies. (right) Six-year-old Aliya and her father await donor corneas. 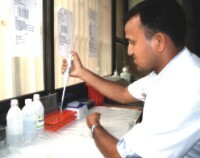 A technician uses a Kertu Analyser for endothelium cell count. 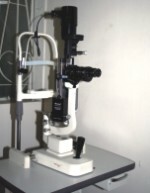 The slit lamp used for cornea evaluation. Two-year-old Yasin injured his left eye in an accident, a cornea transplant is his sole hope for restoring his vision. A team of SIEB technicians. A donor cornea suspended in MK Medium. A loud wail rented the still summer air. Rushing out into the courtyard, Md. Abu Taher’s heart lurched in his chest as he came across Hanif, his infant son, clutching his eyes and writhing in pain. The child’s parents did their best to soothe his agony, but to no avail. Soon an opaque white film obscured the child’s irises. Hanif, suffering from congenital blindness was rapidly losing sight. The incident was an eye-opener for his parents as they realised that their son was going blind. The next few months went by in a flurry of visits to the village clinic and a host of doctors, but no one could offer any help. Abu Taher grew increasingly dejected as he watched his child flounder around the house, unable to see. His quest to restore his son’s sight led him to Islamia Eye Hospital in Dhaka, and the cure, corneal transplant. Thus began Abu Taher’s tryst with Sandhani International Eye Bank. 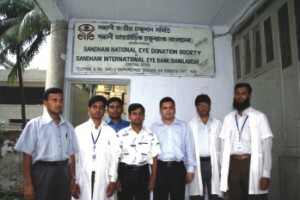 Sandhani National Eye Donation Society (SNEDS) began its journey three decades ago, in 1977, championing eye donation in Bangladesh. It rose from its humble beginnings at the DMCH as an initiative of a group of Dhaka Medical College (DMC) students and made its mark in1984, when it launched Sandhani International Eye Bank (SIEB). Their activities were spread across the labyrinth of government medical colleges all over the country, promoting posthumous (voluntary) eye donation as well as handling collection, preservation and utilisation of human eyes. Their range of activities also include social and scientific research in the field of ophthalmology and making people aware about how to prevent blindness through organising awareness programmes for prevention of blindness, seminars, training programmes etc. 1984 also went down in history as the year Sandhani undertook its first cornea transplant. Performed on an eighteen-year-old girl, Tuntuni, whose childhood was marred by corneal blindness, the transplant was undertaken by Dr. Hudson Silva. Dr. Silva donated his expertise as well as arranged for the transport of a pair of corneas all the way from Sri Lanka. The cornea is a clear transparent layer that covers the irises. Blindness occurs when the cornea becomes cloudy and prevents light form entering the eye, thereby robbing sight. Corneal blindness is a condition that can be rendered congenitally, due to vitamin A deficiency or afflicted by an injury. In Bangladesh, most of the cases come from the rural areas affected by malnutrition and hence a vitamin A deficient diet. Often, cases arise in farmhands who work in the rice fields, and injure their corneas with stray pits. Statistics show that over 526,000 people in Bangladesh suffer from corneal blindness. The current rate of cornea collection by SNEDS is only around 100 to 150, and based on this data, Sandhani has projected that restoring the sight of all those affected by corneal blindness in Bangladesh alone would take around 3,500 years! Increasing numbers of corneal blind have pressed Sandhani to expand their influence, an initiative supported by ORBIS International. Till date, Sandhani has successfully restored the vision of 792 fortunate individuals since February 2004 and they have collected a grand total of 944 corneas since then. On any given day, Sandhani witnesses a constant stream of expectant recipients. Shapla, a student of class seven frequents the facility with her father, who is hopeful that a corneal transplant will restore his daughter’s rapidly dwindling eyesight. While Shapla, a shy, thirteen-year-old, is concerned that her poor vision will hinder her education, her father is more concerned about her future. Hailing from rural Bangladesh, he is worried that her blindness will turn away potential suitors. Two-year-old Yasin’s family is another group of enduring hopefuls. He is no different than any other toddler, running the halls grabbing at aesthetically appealing objects and throwing tantrums. It’s only when you look into his face that you see the telltale bluish white discolouring of his left iris, that you realise he has blighted sight. He injured his cornea in a mishap barely two months ago, and has only been on the waiting list a very short while. 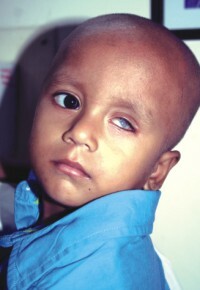 With his entire life lying ahead of him, Yasin has a good chance of being pushed up in the waiting list for a cornea. The selection process works on a first come first serve basis, but due consideration is given to cases like Shapla’s and Yasin’s, where patients stand to gain more out of life with a successful transplant. Factors such as age, the ever-impending doom of unemployment and facing a life of complete blindness if a transplant is not done immediately– all play a crucial role in the selection process. In an E.R. like moment, a phone call from a donor’s family sets the whole facility into motion. A team of two technicians and a counsellor rush to the waiting ambulance and leave, sirens blaring. The swiftness of the procedure is remarkable. The technicians conduct an on-site evaluation of the donor, checking for marks of intravenous drug usage and possible medical history. The technicians have six to eight hours from the time of death in which to remove the cornea from the donor. The entire process takes as little as fifteen minutes and is conducted in extremely sterile conditions. The cornea is extracted from the deceased person using a corneo scleral rim excision, which eliminates the necessity for removing the entire eyeball. Hence, there is no disfigurement, often a major issue amongst family members of the deceased. Md. Saiful Islam Choudhury, Communication Officer, SIEB, elaborates that Sandhani is conscious of the delicate nature of extracting the eyes of a loved one, and assures that it is done with the utmost care and respect. In this method, technology enables the extraction of a thin white tissue from the eyes of the deceased, and an artificial transparent cap put in place to restore a natural look. This method eliminates the use of whole globe enucleation, whereby the entire eyeball is extricated. 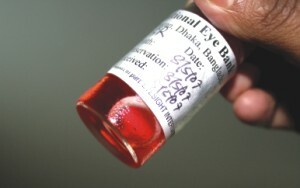 After the cornea collection, they are subject to a battery of tests to evaluate and grade them, after which they are shipped off for surgery if a patient has been selected. Those not used are preserved for the future. Corneas can be preserved for up to four days in a special preservative medium, the MK Medium. The transplant itself is a surgical procedure that involves replacing the disc-shaped segment of a damaged cornea with a matching piece of healthy donor cornea. The process of grafting the donor cornea onto the recipient can take as little as an hour. While the patient can see soon after surgery, complete vision is expected within six months. Asides from posthumous or voluntary cornea donations Sandhani also collects corneas from unclaimed bodies. In fact most of the corneas come from unclaimed bodies, a practice Sandhani hopes to ease out of as awareness regarding cornea donation rises amongst the community. There is another unique strategy to get the much-needed corneas. Sandhani’s small office at the DMCH includes a group of grief counsellors, who work on eight-hour shifts. Their main purpose is to patrol the wards and approach families of terminally ill patients or those who have recently lost someone. Using extreme tact and counsel they champion the cause of cornea donation. They target all those who pass away in the DMCH wards, an average of 24 per day. A hundred percent success rate in this sector alone will make a significant impact towards the cause. It is important to discuss the delicate matter without offending the deceased person’s family. Md. Tariqul Islam, an eye donation counsellor says that it is very important to establish a rapport with the inhabitants of each ward, and offer the families of the patients their support. Working as a counsellor is akin to walking on hot coals, as dealing with the death of a loved one is extremely difficult. Often the counsellors are seen as intruders and their actions are misinterpreted. ‘We have had to deal with a lot of angry family members. But that is expected. We understand how hard it is to lose someone. But we still have to work around it. That’s how we have been trained,’ says Tariqul. Most of the staff at SIEB has received training in their respective fields on Eye Banking from L V Prasad Eye Institute, Hyderabad, India. Mir Moshiur Rahman, Eye Bank Project Director for Sandhani International Eye Bank says that the biggest challenge in the arena of cornea donation is lack of awareness. Most people do not know that the option exists and the society is riddled with ignorance and misconception that makes donating organs a gray area. He stresses that religion does not bar eye donation and that eye banks are successfully functioning in most Muslim nations but lack of awareness regarding this issue forces religious prejudice in our country into the limelight. The walls of Sandhani are adorned with images of pioneers in cornea donation, framed in eternal memory. In the noblest of acts, Rajib Ali donated the eyes of his beloved wife, Angura Begum after she succumbed to injuries at the DMCH, the story of which has been heralded by numerous national dailies. Age, poor eyesight or diabetes do not bar a person from being eligible cornea donors. Just about anybody can donate their corneas if they wish to. Only in cases where the donor has died of AIDS, syphilis, viral hepatitis, rabies, tetanus, septicaemia etc. are the cornea regarded as unfit for sight restoration. The process of being an eye donor is surprisingly simple. A quick phone call, or a visit to their website is all you need to receive a donor form, which is delivered to your doorstep. On receipt of the completed form, the donors are issued an eye donor card, which fits quite snug in your wallet. One can also donate the eyes of their kin by simply getting in touch with SIEB and informing them of the death in their family. The donor family does not need to pay any fees for the removal of the corneas. The corridors of Sandhani often ring out in chatter. Many of the recipients drop in from time to time. Johnny Ahmed, is one such grateful recipient. Suffering from corneal dystrophy, Johnny lost complete vision in his left eye early in life and was rapidly losing sight in his right, a condition that was hampering his ability to provide for his family. Desperate, he began frequent trips to hospitals in Dhaka, searching for a cure, until he finally stumbled upon Islamia Eye Hospital, where he was recommended to undergo a cornea transplant. He was the sole instigator in his recovery, single-handedly visiting doctors, approaching Sandhani, who within a span of three months had a cornea ready for him. By 2004 he had undergone surgery in both eyes. “I never knew such a technique existed. I was extremely nervous about the surgery and had trouble grappling with the idea of having another person’s cornea surgically implanted into my eye,’ admits Johnny. Yet he went in for the transplant, knowing it was his sole option. His vision restored, Johnny went on to work for a popular restaurant in Dhaka and is now the proud benefactor of his entire family based in Pabna. “When I opened my eyes after surgery, I was awash with this feeling of pure exhilaration. I can’t quite put into words how I felt at that very moment,” reminisces Johnny with a wistful smile on his face. Five-year-old Hanif has undergone cornea grafting in his right eye, and his vision has been restored. He now waits for transplant in his left eye. His father, Abu Taher, an impoverished labourer at a saw mill, watches him, as he pelts down the hallways, and voice shaking with emotion, says ‘I can’t explain what I feel now when I watch my son run around like a normal child. I’m so grateful to Sandhani for bringing the light back into his world.’ Sandhani, recognising his impoverished situation, had arranged for the entire transplant to be carried out free of charge, a fact that Abu Taher has no introversion in mentioning. With a sense of pride that can only be accorded to the likes of fathers, Abu Taher beckons to Hanif pointing at my pen he asks vociferously, ‘What colour is that?’ Hanif replies in his squeaky, little boy voice, ‘Black.’ Both father and son break into identical toothless grins. I walked out of Sandhani that day with my donor card. I hope this story inspires a few others do so as well.